Have you heard of OneSTL? Some Saint Louisans have, but aren’t sure who they are or what they do. Is it one big organization or is it made up of individuals and what do they do? The blog this month will introduce you to the people of OneSTL, what their ambitions are and provide information about how to get involved in the launch of OneSTL’s Material and Recycling working group campaign: Recycle Responsibly. OneSTL is a conglomerate of local government agencies, not-for-profit groups, institutions and individuals working together to implement solutions that will have a positive affect on our communities now and in the future. This group is comprised of people from five counties in MO and three counties in IL, including: St. Louis City, St. Louis County, City of University City, St. Charles County, Jefferson County, Franklin County, Madison County, Monroe County and St. Clair County. OneSTL’s mission is to “plan for a prosperous, healthy, vibrant St. Louis Region” while encompassing sustainability as an important factor in their planning. They define sustainability as “meeting the needs of the present without jeopardizing the opportunities of future generations to meet their needs”. OneSTL’s motto is “Many Communities. One Future.” which means bridging the divide among communities to make St. Louis more cohesive. OneSTL has six working groups that focus on a particular area that needs public attention and involvement. These six working groups are: Water and Green Infrastructure; Materials and Recycling; Transit Oriented Development; Energy and Emissions; Biodiversity; and Food Access. To learn more about any of these working groups, visit the OneSTL’s ‘Get Involved’ page and endorse targets or join a working group. The participation of individuals and organizations that compose OneSTL is proof that St. Louis is dedicated to improving the health, neighborhoods and environment of its residents. To learn more about the OneSTL efforts, network or to get involved in the conversation, join the Sustainability Labs held at T-Rex on the last Tuesday of every month! Saint Louis City Recycles has been involved in the Materials and Recycling working group since it formed in early 2017. This group is also is composed of our Materials Recovery Facility (MRF), waste hauler, universities and other government agencies with a target to “reduce tonnage of waste going to landfills within our wasteshed by 30% by 2030 from a 2015 baseline.” The three strategies members of the group chose to focus on were education, waste reduction infrastructure improvements and policy advocacy. We have worked together to develop a simplified and cohesive recycling message, increased public outreach and education as well as launching OneSTL’s newest campaign: Recycle Responsibly. The Materials and Recycling working group has been collaborating and strategizing ways in which to educate and involve the public on the contamination issue that led to China rejecting most of the United States’ recyclable materials in early 2018. Our working group rolled out the Recycle Responsibly campaign in November 2018. Before the campaign could be launched, the working group created a united recycling message to help people learn how to “Recycle Responsibly”. A united recycling message was valuable because all of the accepted material in our area goes to the same MRF. It does not matter if you live in Valley Park, University City or South City, all of the accepted materials are the same. It’s easy to remember, “Stick with the Six!”. The six categories to ‘stick with’ are paper, flattened cardboard, plastic bottles and containers, glass bottles and jars, metal food and beverage cans and food and beverage cartons. Sticking with these six items helps fight contamination by educating people what can and cannot go in the recycling bin. 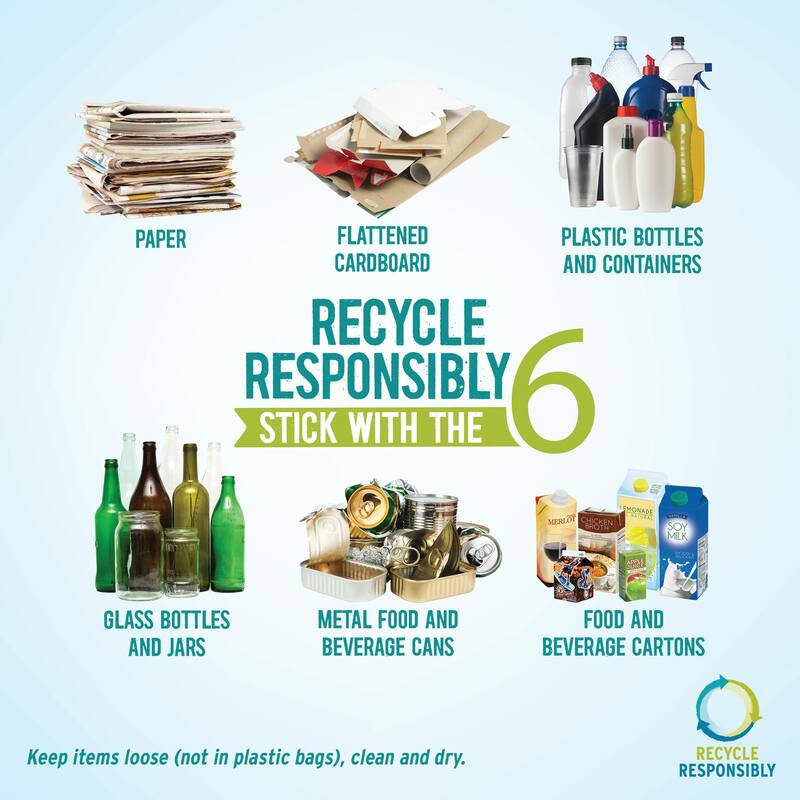 When recycling, it’s easy to “Stick with the Six,” but also remember “Not on the list? Not in the bin!”. If your item isn’t on the accepted list, it cannot go in your recycling rollcart or alley dumpster. But, that doesn’t mean its life is over! To find out where to take items beyond your Blue Bin for donation, repurpose or recycling, visit our database. Remember, some items belong in the landfill. 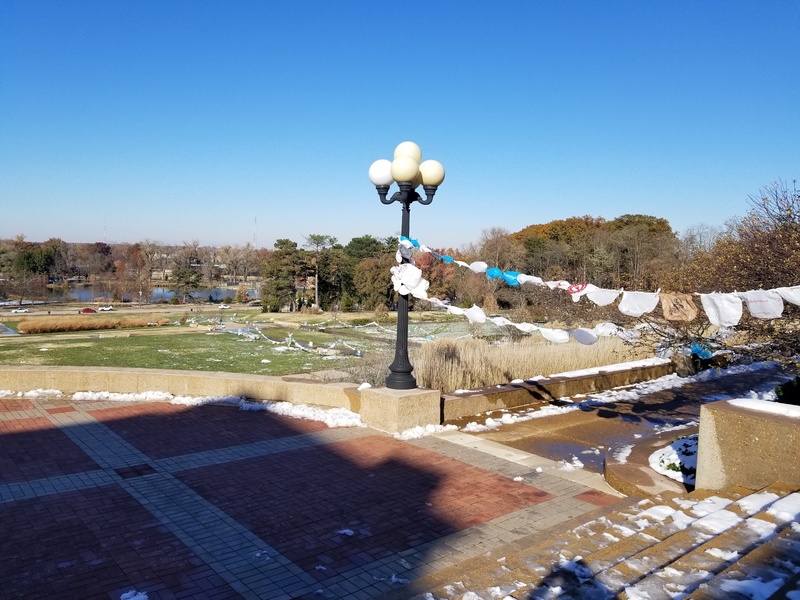 A kick-off event was held in celebration of America Recycles Day at the World’s Fair Pavilion in Forest Park to highlight the impact of plastic bags. 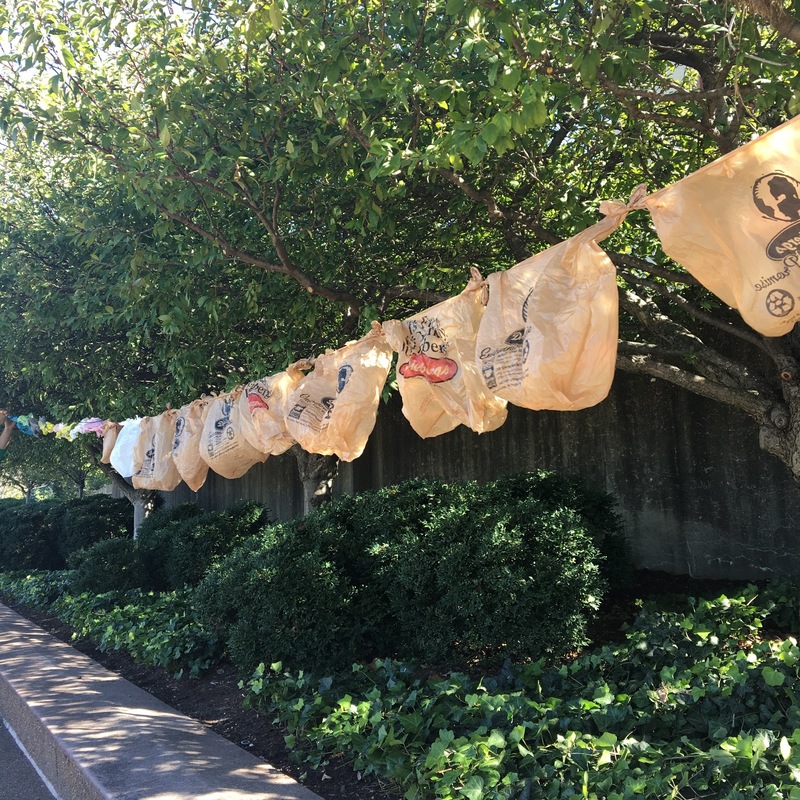 This event, Recycle Responsibly: The Truth About Plastic Bags, showcased 2,663 plastic bags tied together. Why 2,663? That’s the number of plastic bags used by Americans every SECOND! The art instillation was over a half mile long and consisted of over 50 facts about plastic bags. Plastic bags have harmful affects on humans, nature and our environment. The top contaminants found at the MRF are plastic bags, bagged recyclables, clothing and food waste. Plastic bags are damaging at the MRF because they jam the machinery which shuts down operations so workers can cut out plastic bags. It’s a very dangerous job! Plastic bags and film should be recycled separately from your single stream recycling and taken to a grocery or retail store to recycle, or placed in the trash. To find a place near you and learn what other items you can recycle with your plastic bags, visit PlasticFilmRecycling.org. To find ways to get involved, visit the OneSTL website, follow on Facebook and Instagram at @OneSTL. Want to become a Recycling Ambassador? Sign up here! The Recycle Responsibly campaign is funded in part by the St. Louis-Jefferson Solid Waste Management District and the Missouri Department of Natural Resources.